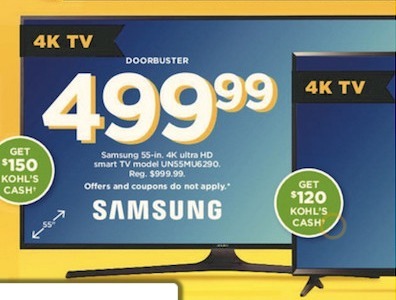 Kohl’s will be kicking off their Black Friday deals on Thanksgiving, and starting 5 p.m. November 23, you’ll be able to shop some of this year’s best deals for televisions – and not just any, 4K televisions, KitchenAids, video game consoles, Fitbit products and diamond jewelry, this on top of all the other offerings packed inside the ad’s 64 pages. But what you really want to know is what’s worth stealing from Kohl’s this holiday, so let’s just lay them out – the five hottest Black Friday deals. 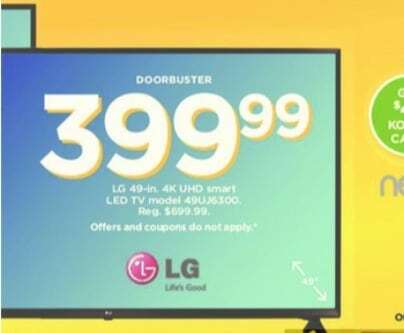 What’s so good about this offer is that if you have Kohl’s Cash to spend, you get to pay a net price of $350 for this name-brand 4K television. 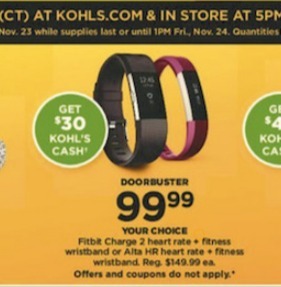 You can earn Kohl’s Cash anytime between November 20 and November 25 to redeem in stores and online until December 6. But remember that even if you buy at $499.99, it’s still a good deal since this Samsung TV normally costs around $700. This offer comes with a choice, which means you can choose the Fitbit Charge 2 heart rate + fitness wristband or you can choose the Alta HR heart rate + fitness wristband. Whichever you choose, you get $30 Kohl’s Cash to use at any store or online. Normally costing $179.99, this makes for a good offer. 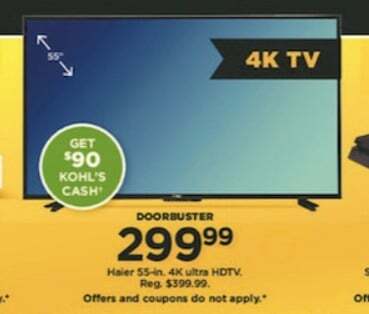 While Haier 55″ 4Ks have sold for $300 before (so this isn’t a door busting deal per se), this time the TV comes with $90 Kohl’s Cash, which means you’d be paying a net price of $210, and this is the best price ever for a 55″ 4K television of any make. It features 4 HDMI ports and amazing picture quality, plus if you shop online you can pick it up in store for free. Or get the Microsoft Xbox One S 500GB at $189.99. 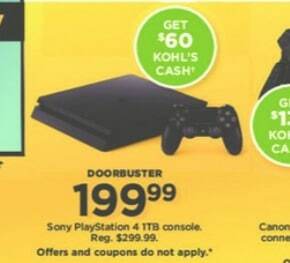 The Playstation comes with $60 Kohl’s Cash and for anyone who shops at Kohl’s, this is a must-have since they probably won’t be lowering the price any further this year. And if you can wait to use the Kohl’s Cash, getting a triple A title for full price is going to turn this one into a best deal. You’ll basically be having a console and game bundle for under $200, which is as good as it could get now. A good deal that gets even better when you factor in the $120 Kohl’s Cash that come with this offer. The television itself offers a fantastic viewing experience, with HPR and IPS capabilities that every 4K piece of technology claims to have but not all provide. No doubt about it, this is one of the best 4K TV Black Friday deals, with $300 savings and everything you’d expect from a trusted brand.